There was a time when athletic girls were relegated to “bringing it on” for the big boys. Now girls can grow up to be award-winning, respect-worthy sports stars. Able to leap buildings in a single bound, Gabby Douglas proved she was the real deal in London. Her prowess and personality have already landed her individual medals and marketing deals. Will this be the first of many Gabby-centric products? Hoarders alert: the cereal box is being touted as collectible! The Gold Medal U.S. gymnastics team visited with NBC host Bob Costas. What is fascinating is that there is nary a blonde among the winning team members. Blond Ambition—Barbie shows that she can be anything! Here she sets her sights on Olympic medals in tennis, gymnastics, and track. 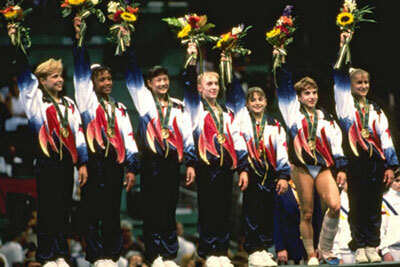 The women’s gymnastic team took the Gold for America in Georgia, back in 1996. The team was comprised of girls from all different races and ethnic backgrounds, celebrating the country’s diversity. A candid shot of six of the seven 1996 gymnasts reflects a unity and a bond that can’t be beaten. Created to key into the 1996 Games that were held in Atlanta, Georgia, the blond-haired Barbie embodied what the “typical” gymnast looked like. 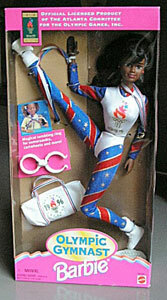 Marketed as part of the official merchandise for the 1996 Georgia Olympic games, the African-American Barbie was a subtle nod to Dominique Dawes, who went on to achieve Gold at the competition. 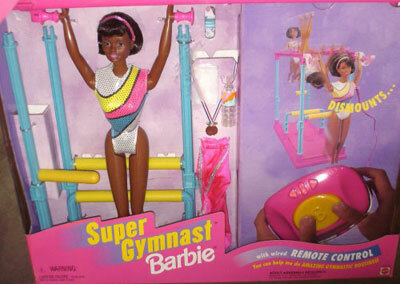 From 1999, the remote-controlled Super Gymnast doll from Mattel is able to do gravity-defying stunts. Just repackage and re-introduce this as the Gabby Douglas stunt double! Yes, I’m not a jock. 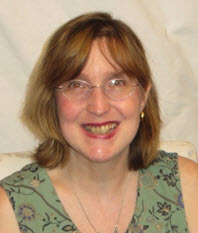 I do like to swim, but mosquitoes have kept me a virtual shut-in this season because I have grown tired of being a walking smorgasbord for those airborne critters. When I leisurely dine at an outdoor barbecue, the bugs feast on my exposed arms and calves. When I try to walk quickly and elude them, I become literal “fast food.” It’s a lose-lose proposition for me these days when I think about the great outdoors. That’s why the summer games are such a treat for me: I get to receive a healthy dose of fresh-air activity and brilliant blue skies, while reclining comfortably on my couch! Last week, I opined about who would be potential athlete dolls. 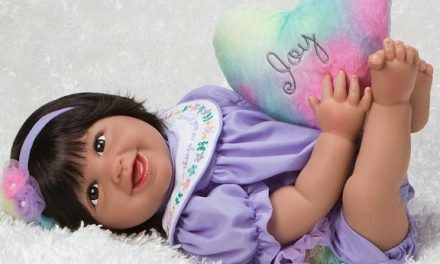 The U.S. gymnastics team seems the surest bet because they represent a beautiful blend of ethnic groups and cultures that flourish in the United States, and doll manufacturers historically respond well to peddling and promoting Caucasian, African-American, Hispanic and Asian versions of a basic design. (Remember, the 1996 U.S. gymnastics team scored a Gold in Atlanta, and their makeup was very much a marvelous mosaic of who comprises America in the 20th and 21st centuries. 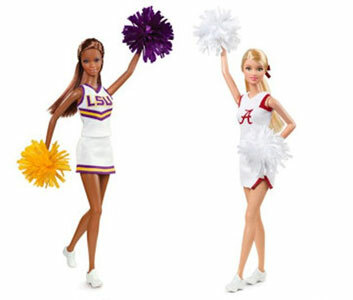 Their non-likeness tie-ins from Mattel featured Barbies of all different complexions decked out in red-white-and-blue gear.) Interestingly, lots of cynics used to bellyache that the black gymnast Barbies were just “token” creations done for politically correct, make-nice reasons. I have five words for those jaded jerks: Dominique Dawes and Gabby Douglas! It’s interesting to think of cereal boxes as collectibles, and perhaps that will be where the lucrative money is—twenty or thirty years from now. People who recollect the 2012 Olympics fondly will be looking to recapture the glory by purchasing Proctor & Gamble paper products. 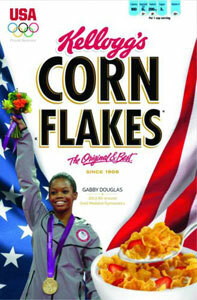 Though I don’t encourage anyone to go out and spend a week’s wages on swooping up Gabby Douglas cereal likenesses, I think that is a real brave gamble on how the market will behave in three decades. Let’s see if Mattel follows suit with an official Gabby doll or a medal-wearing nonspecific homage. Inspired by the athletes and their attainment of near perfection, I let my fingers stroll over to eBay. I was curious to see what an MIB or NRFB “Flo Jo” doll is fetching during the heat of Olympic mania. 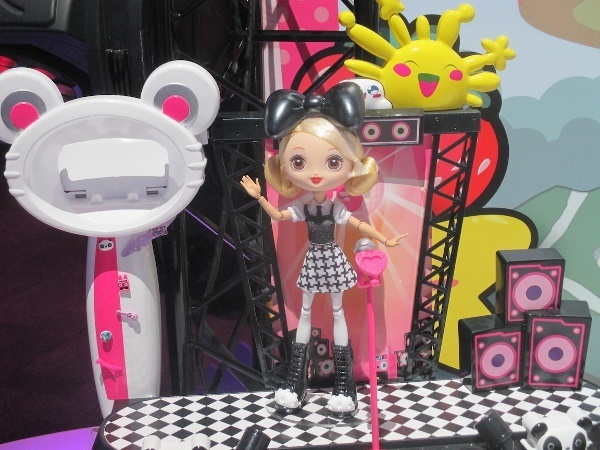 Interestingly, the doll ranges in prices from $11 to $32. (Though one delusional person is offering the fashion doll version and action figure for $120. Good luck on getting that bid.) Considering that collectors have held on to that doll for 24 years, the asking prices are not high at all. I next investigated the Williams sisters’ likenesses: I found the Play Along Serena Williams “American Champion” doll up for bidding at $74. On the heels of Serena’s recent individual Gold performance in tennis, perhaps that amount will be attained. However, my gut (which is more considerable than I’d like) tells me that $35 would even be a better match. What this tells me is that we all should collect what we enjoy and what we want to surround ourselves with in the here and now. In the past I’ve purchased some dolls that I had no personal interest in or fondness for. I bought them as “investments,” and I wonder how long I shall have to wait to see the revenue streaming in from them. On the eve of September 2021, when my son is heading off to college—hopefully—will I make enough money from these past mercenary buys to afford one semester? One textbook? One number-2 pencil, perhaps? I think doll collecting—or collecting of anything for that matter—should be handled the way an Olympian approaches her realm of expertise. If an athlete doesn’t enjoy what she’s doing—if there isn’t a bedrock of joy or satisfaction or completion at the base of her training—she’ll never grow into a successful sports figure, let alone a sports star. The same holds true for our doll acquisitions. If we’re simply buying and storing with an eye on some long-distance haul, the actions are soulless and just draining—financially and emotionally. We should love what we’re doing, and see our dolls as emblematic of what we care about and care for in our lives. No, I think we should all be like Gabby Douglas, the gymnast, in our doll affairs. We need to center ourselves, consider the apparatus, take the bars in our hands or the beam in our toes, and then fly. When we’ve made the right choice to collect, we’ll be landing with top scores in our accounts. And the dolls on our shelves will be as priceless as a Gold Medal win, just as this Lego reenactment proves (http://www.guardian.co.uk//sport/video/2012/aug/01/brick-womens-gymnastics-usa-gold-video). 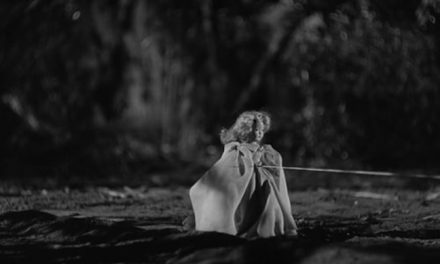 NextA Touch of Evil: Disney debuts a lineup of designer villains that are gorgeous and ghastly!